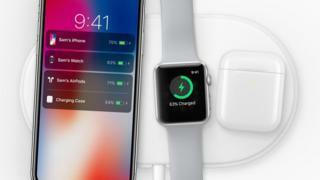 Image caption AirPower was billed by Apple as a "world-class wireless charging solution"
In a statement emailed to the BBC, Dan Riccio, Apple’s head of hardware engineering, said: "We apologise to those customers who were looking forward to this launch. We continue to believe that the future is wireless and are committed to push the wireless experience forward." The cancelled product could affect sales of the company’s wireless headphones - AirPods - which were promoted and sold with the promise they would be charged using AirPower in future. Packaging for the AirPods contained a diagram of how AirPower would work.